Help… How do I find friends to ride my bike with? One of the things I often get asked, and particularly from women, is “How do I find friends to ride my bike with?”. And you’ll be pleased to know that it’s not that hard to find like-minded riders, both women and men. When I first started riding a road bike about eight years ago, I did ride around on my own a fair bit, but over time I found like-minded riding companions who I now consider to be amongst my best friends. Over the years I’ve found lots of buddies, both women and men, some of whom have already come and gone in my life. Others who have stuck. The first step for me was to find a local group of riders who already met on a formal basis for a weekly ride. For me, this group was called BayBUG which in long form is Canada Bay Bicycle User Group. 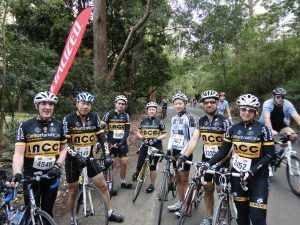 There are BUGs all over NSW which are formed under the auspices of Bicycle NSW and cater for beginner riders. It was ideal for me, and it gave me an introduction to group riding and plenty of riding buddies. Over time, as the group got to know each other better we formed some subgroups (some might call these cliques) and started riding on Sunday as well as the regular Saturday ride. As a group we also moved on from the original BUG, and now just ride as a group of friends. The next step was for me to join my local bike club of which I am still a member. This gave me access to regular training rides. I could have actually joined some of these rides without actually becoming a club member but I liked the idea of being part of something. This has also meant that I’ve met lots of local bike riders, including my now boss. Another technique for ensuring that you have ride buddies is to be the organiser. I’m a natural born organiser so it comes easily to me. If I want to go for a ride on any particular day then I send out text messages or emails to my chosen companions the night before or even a couple of days out. You’d be surprised at how many people will accept your invitation. They might not think to organise it themselves, but they’ll happily come along if you invite them. As the ride organiser you also get to choose where you go, and how far you will ride. An extension of this for me is the weekly ride I lead for my bike club LACC. It’s a women’s only bunch ride and runs all year round on Wednesday morning. I’ve met plenty of great women on this ride and now call many of them friends. We’ve also organised other rides from this regular ride as a spin-off. So look out for women’s only rides in your area. They are run by bike clubs, BUGs, bike shops, and other less formal bike riding groups, many of which will have websites for Facebook pages. And if all of these methods fail, you’ll find plenty of cyclists frequenting the local cafes anywhere from 7.30 to 9 am. Just ask them where they ride and if they are happy for new riders to tag along. Most cyclists I’ve met this way are friendly and open and willing to help out. And occasionally you’ll find yourself all alone on your bike, and you’ll probably quite enjoy it, as I do. I’d love to hear from others on how you find friends to ride my bike with? Share via comments or the Women Who Cycle Facebook page. They would show me paths and tracks in my area that matched my riding style.